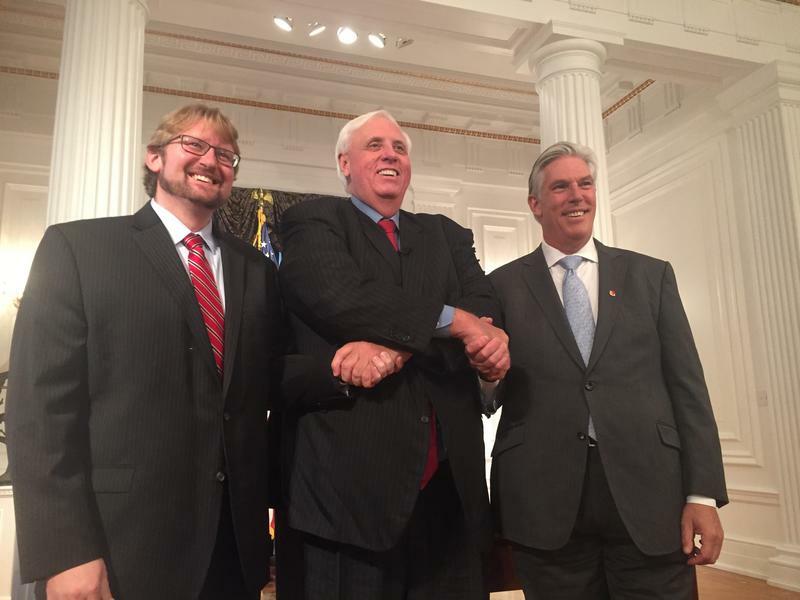 (Left to right) WVU Energy Institute director Dr. Brian Anderson, Governor Jim Justice and state Commerce Secretary Woody Thrasher pose for photos following a press conference about an $84 billion investment announced last week with China Energy. Governor Jim Justice and state commerce secretary Woody Thrasher held a press conference Monday to outline how the deal came about, but didn’t provide specifics about the memorandum of understanding, or MOU, between Chinese industry leaders and West Virginia government officials. Thrasher revealed last week that early projects would include two natural gas-fired power plants, likely in Harrison and Brooke counties, with construction potentially starting in the next six to eight months. He and officials from the Shenhua Group, who are part of the state-owned China Energy company, have agreed at this point to not release additional projects or the MOU, which is understood to not be legally binding. WVU Energy Institute director Dr. Brian Anderson added that potential projects would run the entire spectrum of natural gas and petrochemical products and facilities. He did mention interest in building an underground storage hub for natural gas liquids, which he says would link to production facilities through pipelines. Secretary Thrasher noted that China Energy’s interest in West Virginia had waned at various points in the negotiation process, with investors considering locations in Texas or the U.S. Virgin Islands. With some details of the agreement unclear to the public and nothing legally binding as of yet, Justice urged a sense of cautious optimism moving forward. Thrasher said there is a schedule moving forward to solidify potential projects and that he expects to see construction beginning by this time next year. Both he and Justice attribute the potential investment to Justice’s relationship with President Trump and Trump’s interest in reviving West Virginia’s economy.